Ojai Valley Inn Hole 2: This short par four has a fairly wide fairway (especially since driver is really not needed), but the oak trees block part of it, and the hidden bunker, from view. Finding the short grass is a must to give an open approach over the dry creek to the green on the other side. Ojai Valley Inn Hole 3: A wonderful, short, natural feeling par three, this one has a small putting surface surrounded by deep bunkers and rejecting hillsides for anybody who misses in any direction, with long right and left possibly yielding a penalty stroke to boot. 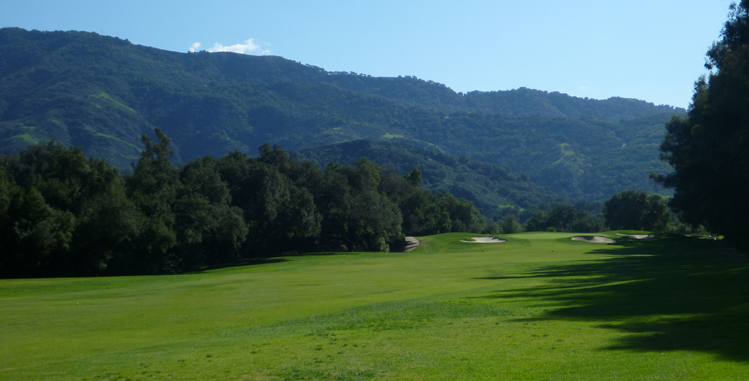 Ojai Valley Inn Hole 4: Uphill enough where it is not really drive-able except for big bombers, the tee shot is beautiful and leaves many strategic options, from the mid iron lay-up, to the drive between the encroaching oak trees only 50 yards from the green. Either way, the green is small and nestled by deep bunkers. Ojai Valley Inn Hole 5: The only test of length on the front nine is a downhill par four with hillside left and large trees right. A mid to long iron will be needed to hit the long and narrow green with a large bunker front-right. Ojai Valley Inn Hole 7: This dogleg right has a seemingly benign tee shot, but without carrying far enough or staying to the left half of the fairway, the approach will likely be blocked by large trees on the right. The uphill approach must avoid the huge bunker left, false front and sneaky back bunker. Ojai Valley Inn Hole 10 (above) and 13 (right): The 10th and 13th play from tee boxes right next to each other and both offer similar, downhill par fours just over 400 yards. The 10 bends slightly to the left and is slightly easier. The 13th, is fairly straight but is is slightly more difficult with more bunkers to deal with and a treacherously tiered green. Ojai Valley Inn Hole 14 (below): This is a long par three with bunkers to the left and the right of the putting surface. If one goes further right or left, trees will also be an issue. 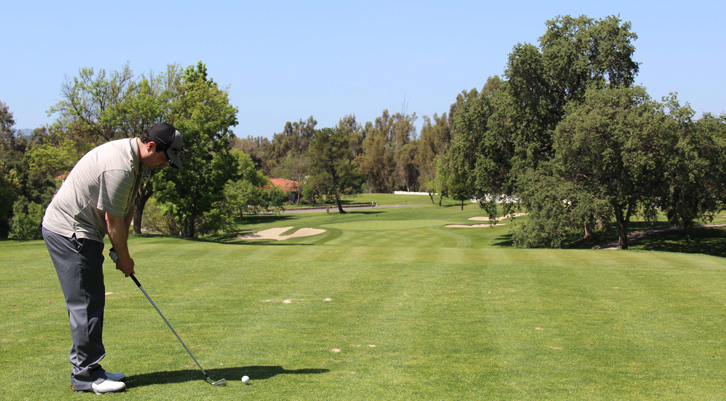 Ojai Valley Inn Hole 15: The longest par five on the course is fairly straight and only minimally downhill. However, although the landing area for the drive is wide, there is OB right and hazard left that gradually pinches in as the hole progresses. The green area is well-bunkered and offers a nice view of he surrounding hills. Ojai Valley Inn Hole 16: One of the least forgiving tee shots on earth features out of bounds right and a hazard left of the green, which gets tighter as the pin moves back. The safest play may be to the myriad of deep bunkers fronting the green, where at least the player can have a putt at par. Ojai Valley Inn Hole 17: The canyon to the right speaks volumes and the tendency will be to favor the sloping left side of the fairway, close to the hillside, which gives a better view of the green and preferred angle to most pin placements. The approach again has danger to the right of the green in the form of deep bunkers and hazard right of that. The putting surfac itself is multi-tiered and very wide. Ojai Valley Inn Hole 18: The ideal drive must carry over the trees left of the visible fairway, but no too far left, which will earn a lost ball. Anything too far right will leave a longer approach to the green, most likely blocked by large trees. The green is elevated between two yawning bunkers, with OB lurking just long for the golfer who is too exuberant in wanting to hit one more GIR. More Ventura Golf Course Reviews Are Waiting.